The GT clinic is the longest running private therapy clinic in Orkney. Started in 1991 providing reflexology treatments and since 2003 has additionally been providing a sports therapy clinic treating sports/non sports injuries. A range of treatments are offered: the holistic approach of classical Reflexology or the specific techniques incorporated in Sports Therapy. 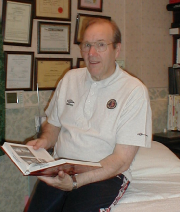 Glenn G. Taylor is a member of the Society of Sports Therapists and member of the International Federation of Reflexologists.